Plenty of people talk a big game and smack talk has filtered down from the highest levels of sport to the worst kind of keyboard warriors. Sometimes it can be funny, other times it’s down right wrong but there is something particularly satisfying about seeing the guy with the big mouth get taken down. 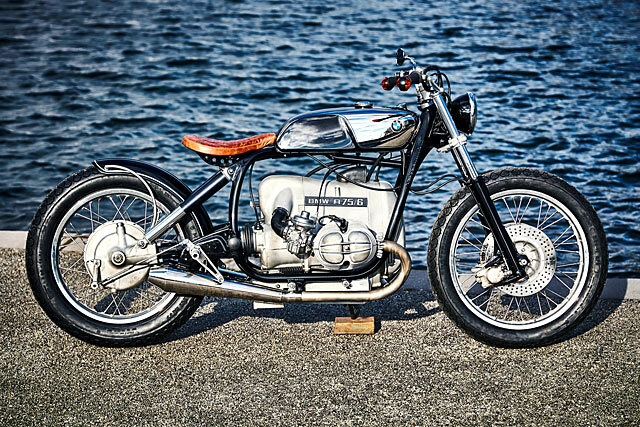 Dirk Oehlerking is a builder who lets his bikes do all the talking, letting others spruik their wears while his killer customs simply take care of the competition. To start 2018, the German owner of Kingston Custom has thrown the perfect overhand right with a stunning BMW R75/6 bobber to put you down for the count. Building only a limited number of motorcycles a year allows Dirk to take his time and ensure everything is done to the highest of standards. 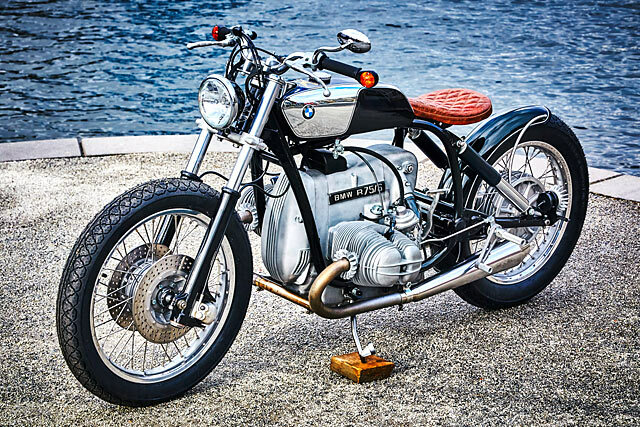 For this R 75/6 that meant a total disassembly until the entire bike and its engine where broken down into individual pieces. This allows for each and every component to be inspected, refurbished where required, replaced if worn out and customised to fashion the final incredible product. To create the bobber look and feel the sprung chassis has the entire rear subframe cut off and no replacement re-installed. Instead a set of Kingston’s own rear shocks are attached straight to the main frame, their design giving a solid strut style appearance. The rest of the frame is smoothed out, heavily de-tabbed and painted in a bodywork matching black. 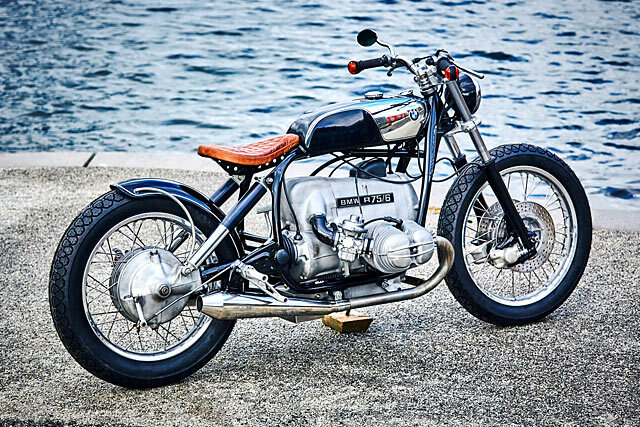 As you’d expect on a bobber there is no front fender but the rear is a thing of beauty and is the second element in the rigid look. 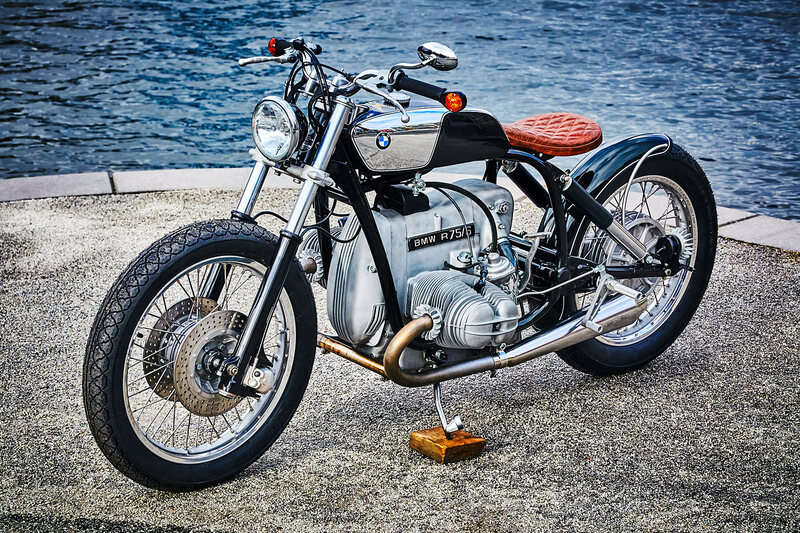 With exquisitely curved struts running off the factory shaft drive swingarm a full rear fender wraps around the tyre floating just millimetres from the rubber at all times. While finishing out the metal work at the rear the drilled seat support relies on mounts from the backbone with the subframe having been removed and completes the second floating element. 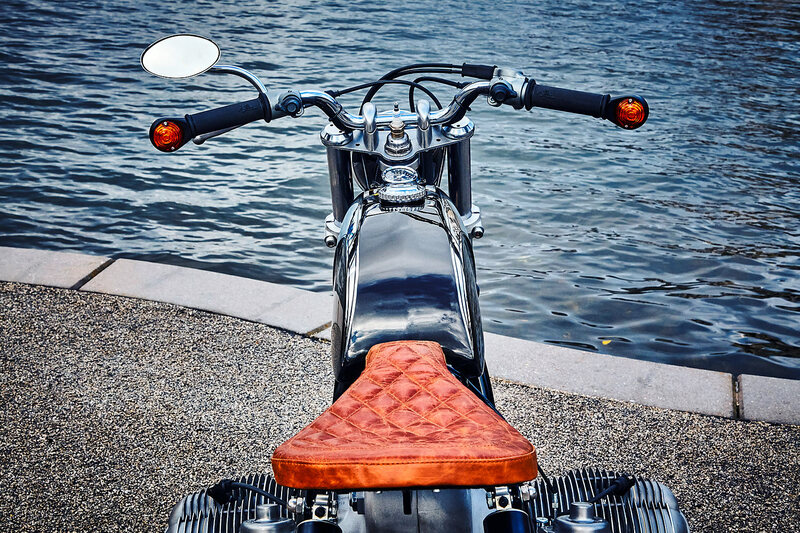 Sitting aboard the solid mount is a gorgeous leather seat, the diamond stitching and distressed leather giving a distinct classic touch. 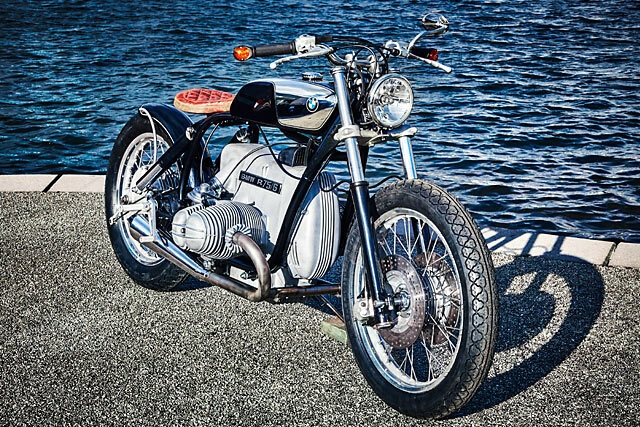 But unlike so many who rely on the use of the factory Bavarian fuel tank, Dirk goes his own way and custom fabricates a secret spec unit that’s slimmed down dimensions are far more befitting of the genre while still retaining some of the original style points. 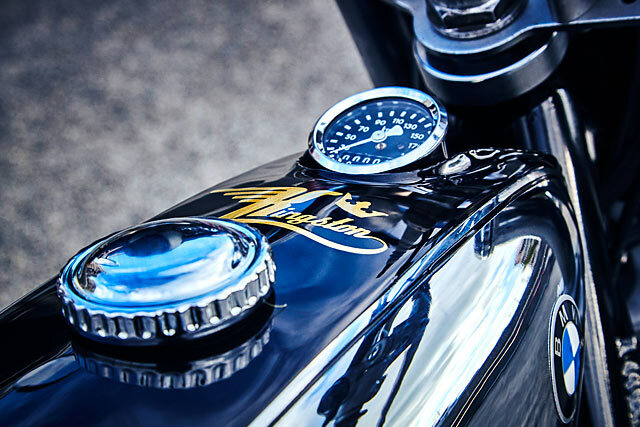 These are further accentuated with the stunning paint job that covers the entire bike, a mix of rich metallic black and large areas of chrome. 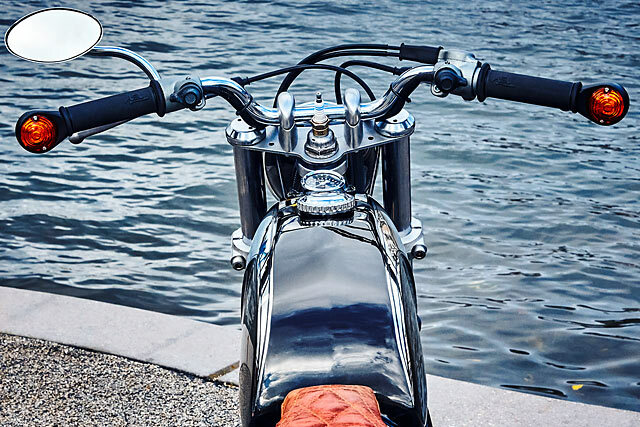 A look that is brilliantly carried over to the rear fender and displayed at the front on the Bates 5 ½in headlight. 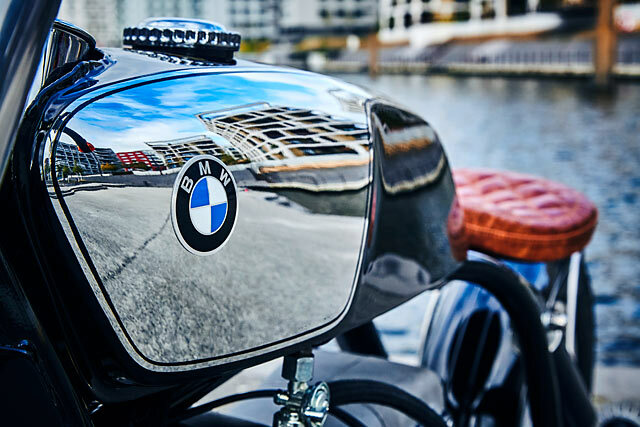 At the heart of it all is the iconic BMW boxer twin that Dirk has become so experienced at he can practical reassemble one hanging upside down with a blindfold on. Totally rebuilt the cases, barrels and covers are blasted to remove years of grime and grit and left in a raw metal finish. From the factory she spits out an even 50hp and every single pony has been returned to this paddock with the Bing carbs also given a full going over. 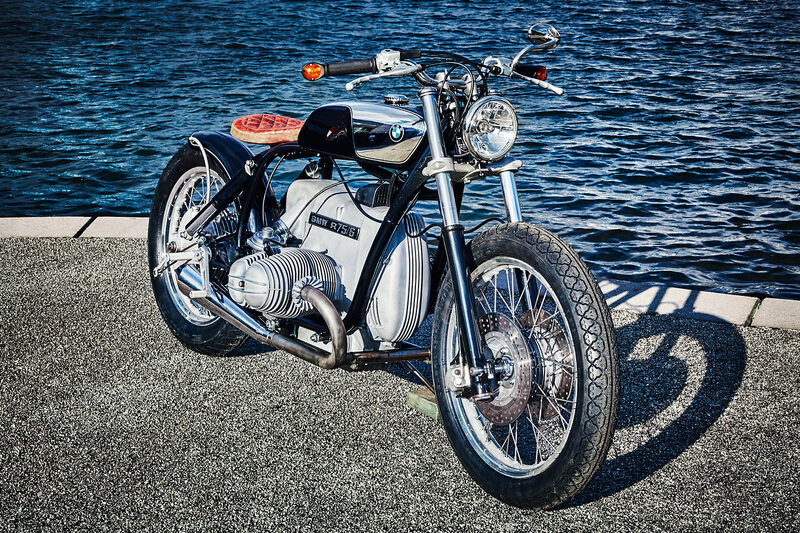 But to really allow the rider to revel in the boxer burble the stainless header pipes feed rearward to twin hand-built HATTECH mufflers designed in-house by Kingston. 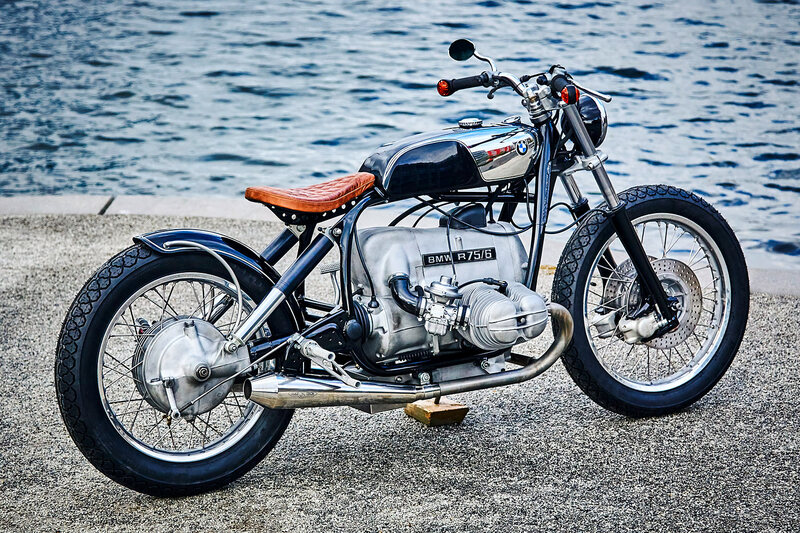 Dirk accurately describes the BMW engine as, “robust technology” but with “average brakes and an average chassis.” It’s the essence of riding a classic motorcycles, but those brakes are given far better feel thanks to LSL steel flex lines. While adding extra grip for the old school chassis is modern rubber in a vintage pattern, Metzeler ME77’s. The rims are custom chrome Kingston items that are laced with stainless spokes to cleaned up factory hubs. 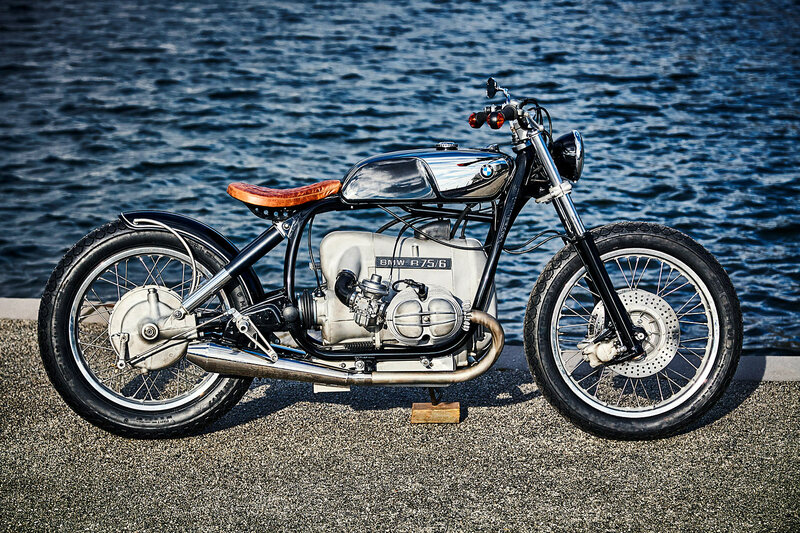 The rear remains factory spec at 18×4 with a 19×3.5 allowing for a slightly meatier front tyre. The front forks are rebuilt to suit the reduced weight and height and dressed up in more metallic black they’re not at all as bad as Dirk implies. Allowing the rider to click through the gears with increased precision is a set of rearsets from Tarozzi with linkages to suit. 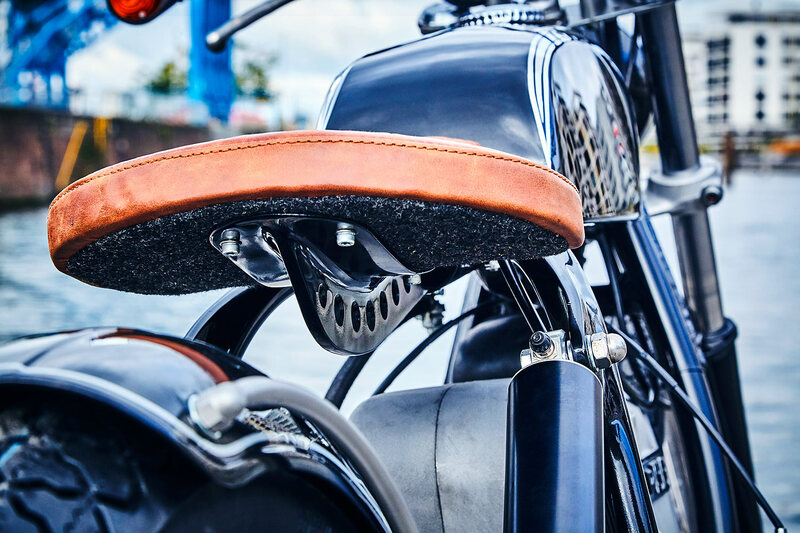 The new bars wear LSL grips but the factory levers have been retained with more modern items deemed unsuitable for the classic ride. But that doesn’t mean there aren’t some new touches with bar end indicators from Hella cleaning up the appearance. Mirrors tend to be a thing of necessity but the single HASHIRU 12 oval chrome brings some beauty to the functional piece. While the MMB single speedo is nestled between the tank and the headstock for a minimalist look that all bobber’s deserve. The final touches are uniquely Kingston, markers of the shop’s belief in placing function and form squarely together. 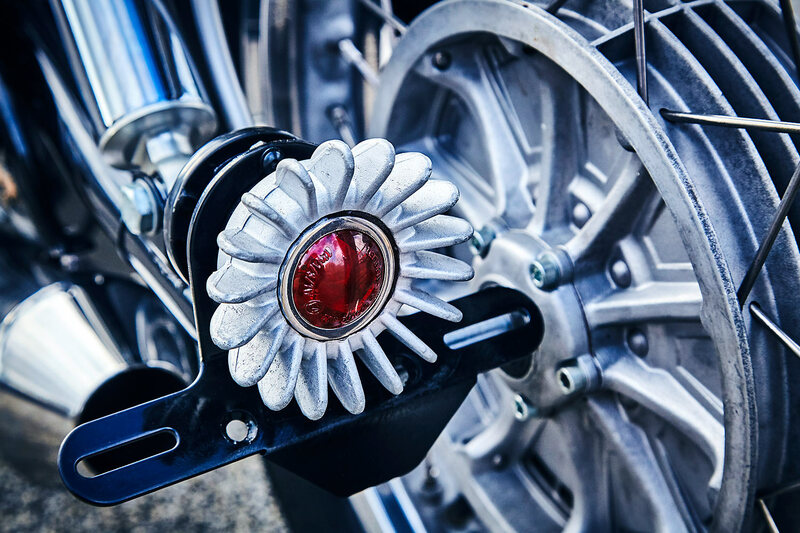 A spare exhaust flange provides the housing for the taillight while a bent up ring spanner creates the most useful kickstand you’re ever likely to see. 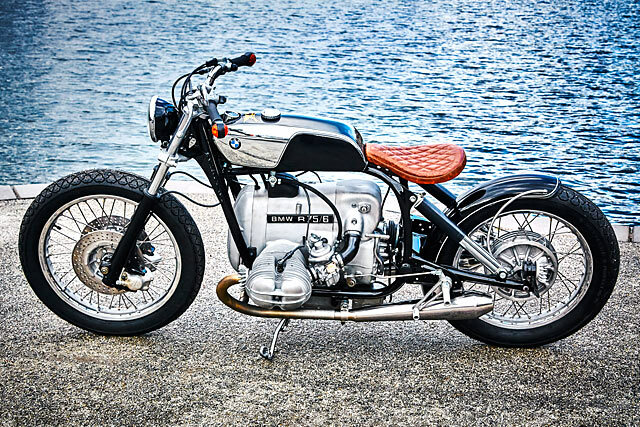 “Working with these classics, giving them new life, changing their lineage, bringing things together that were never meant for each other, is an incredible challenge and deep satisfaction.” It’s a joy only a select few will know given Kingston Custom’s limited run, but even in picture form the BMW bobber with no name is a hell of a sight.